By Kalea Hall | January 21, 2018 at 12:01a.m. I pulled into the U.S. Immigration and Customs Enforcement office at 7:45 a.m. Tuesday. It was bitter cold. It seemed even colder in Cleveland. The hour or so drive felt important. This is the day many hoped Amer “Al” Adi Othman, known as Al Adi, would be able to plead his case against forcible deportation to his native country of Jordan. Adi is a downtown Youngstown businessman I’ve known since 2015. 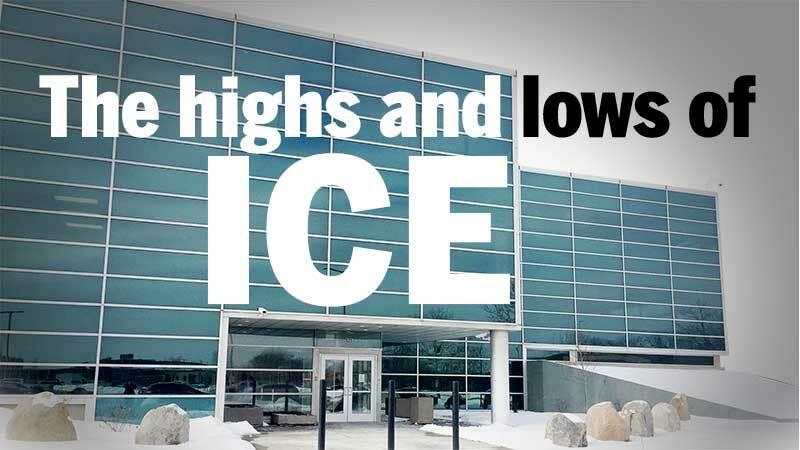 The unmarked ICE building was several stories high with windows all the way around. Above the doors were the numbers “925,” the address I was given and the only way I knew I was at the correct building. I walked inside. Once inside, a security officer waved me over to a small, rectangular room with a metal detector next to his desk. I noticed about 15 to 20 chairs around the edge of the room and didn’t see Adi in one. Some people already were waiting to meet with ICE. It was the size of a waiting room at a doctor’s office. At that point, it wasn’t filled but I knew it would be later. The security officer wanted to know who I was and why I was there. I told him. He immediately said only family could be there to meet with ICE, which I knew. I wasn’t allowed, he said. He told me I could wait in my car. I walked outside of the waiting room to the lobby area near the entrance of the building to text my editor about not being allowed inside before running outside into the elements. Within seconds, the ICE security officer was behind me telling me I had to get out. I did as he said and went back to my car to wait for Adi. Reporters get kicked out of places sometimes. Sometimes I agree, and sometimes I don’t. This time, I didn’t agree, but I didn’t think it was worth the fight. Though I needed the story, given the waiting room’s small size, I preferred that people who had business with ICE got those few seats inside. The event reminded me that many seem to forget journalists are citizens who have a right to sit in a government waiting room or lobby. I got the feeling they didn’t want me there as a fly on the wall watching how this process worked so I could go back and tell the world. I went back to my car and pulled into the perfect spot where I had visual access to the front door and parking lot entrance as I awaited Adi’s arrival. He would come with an impressive entourage: his wife, Fidaa Musleh; friends; his high-powered attorney David Leopold; U.S. Rep. Tim Ryan of Howland, D-13th; and Mahoning County Republican Party Vice Chairwoman Tracey Winbush. Adi was all smiles as he walked to the doors with his supporters. Adi typically was all smiles as many Downtown Circle Convenience and Deli patrons can attest. When I first met Adi, I remember his warmth and excitement about having his business featured in The Vindicator. He was about to open the Circle Hookah and Bar at the back of his convenience store and deli. He opened the store in 2011 and everyone doubted its survival. He was told not to make such a large investment in a deserted downtown. Adi opened his store and proved the naysayers wrong. “It was emotional, and it was a proud mark for me to make the step and take the risk,” he said in my 2015 story. Today, Adi’s store is considered among the keys to a downtown revitalization. After it opened, more business opened and downtown Youngstown became a more walkable, livable, enjoyable place. Before Adi and his supporters walked into the office, I snapped a photo to capture Adi’s smile as he stood with Ryan. Little did I know what that photo would soon represent. About 45 minutes after Adi walked into the office, I continued to watch people shuffle through the snow and slush into the ICE office. Many were toting toddlers and babies in car seats. From what I saw, they were from Mexico or Latin America. I could see people through the window on the side of the waiting room. I knew it had to be packed in there. Then, I saw one of Adi’s friends get out of his truck and begin to walk to the front of the building. I called out to him and asked if there was any news. I can see the shock on his face as he said to me that he heard they took his friend into custody. Shortly later, Winbush walked out of the office with tears streaming down her cheeks. She had the same news: Adi was in custody. For Adi, his wife, attorney and supporters the move was completely unexpected. It was as if ICE intended to humiliate Adi by putting him in a jail cell. Adi had planned to leave on his own accord as instructed by ICE on Jan. 7. He had his ticket. He had his luggage packed. He decided before he left to tell his story and after he did, Ryan, Winbush and others came to his aid. Then, ICE called Adi and his lawyer and said he did not have to leave the country. Adi and his lawyer thought it was a prank call. It wasn’t. ICE instructed them to go to this Cleveland office on Tuesday. They thought this would be a routine check-in meeting as his case was reviewed. As the day wore on, it was clear Adi would not be released. His supporters were outraged. They felt ICE had played an inhumane trick on Adi, and all felt it was wrong. have photographed Adi’s last happy moment in the U.S. And that made me sad. Adi was taken to Geauga County jail and went on a hunger strike to protest his detainment. By Thursday, more news came. The Judiciary Subcommittee on Immigration and Border Security voted to request a report from the Department of Homeland Security to inform the subcommittee as to whether to pass a bill offered by Ryan that would grant legal permanent residence for the businessman. The news meant that Adi’s deportation could be delayed six months and that he should be released from jail. He expected President Donald Trump’s administration to honor the will of the subcommittee and follow the precedent of past administrations. The family, friends of Adi’s and a slew of reporters went to the county jail the next morning, believing Adi would be released. I arrived with Nikos Frazier, Vindicator photographer at 8:55 a.m. As we pulled in, we saw the family walking into the facility. Together, we waited in the plain jail lobby with high ceilings and a small play area for children. 9 a.m. became 10 a.m., and 10 a.m. became 11 a.m.
Then, Adi’s wife, Fidaa Musleh, talked to her husband who said he was informed by ICE he would be transferred to another facility. He didn’t know what facility or when. “They are playing games,” Musleh said. I kept reaching out to ICE for information and had no luck. The jail wouldn’t provide any details to anyone. No one seemed to know what was happening. The jail lobby turned into a state of confusion and desperation. At 1:40 p.m., a deputy opened a door into the lobby. He asks if we are all there for Adi. Then he dropped a bomb: He’s not here anymore. The frustration in the room exploded. Musleh, Adi’s wife of 29 years, and three of his daughters – Lina Adi, 24; Rania Adi, 19; and Lana Adi, 18 – found out with the media that Adi had been relocated. Everyone quickly stormed out in frustration. Again, I watched a family walk off in tears. Again, I wondered what would come next. Again, I came back to the newsroom and wrote a story hoping the words would be powerful enough to make for another story the next day. January 20, 2018 12:05 a.m.
January 19, 2018 1:50 p.m.
January 16, 2018 7:58 p.m.
January 17, 2018 10:55 p.m.
January 18, 2018 12:09 a.m.